1.) Musical instruments with pickups and microphones (dynamic or condenser). 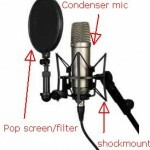 Condenser microphone is appropriate for recording vocals while dynamic microphones is more appropriate for recording guitar using an amplifier. 2.) Next thing is you need a USB or Firewire audio interface that is fully supported in Linux. Now this can be tricky to work with especially if you are only a beginner. For example, I have successfully installed Saffire Pro 40 Firewire audio interface in Ubuntu, and the steps can be complex. Not all professional audio interface are supported by Linux. For details, you need to contact the user support or manufacturer for details. 3.) If you already have a fully working PCI soundcard (not an onboard soundcard!) in Linux, then you can use this for your recording. PCI soundcard is installed by default by common Linux distributions such as Ubuntu unlike the USB or Firewire audio interface. Example of quality PCI soundcard are those manufactured by Creative Soundblasters and M-audio. Although, these are not professional audio interface designed for serious music production; it is doable for amateur home recording use. 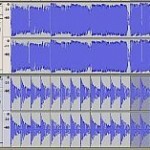 The recording quality would still sound great depending on your skills and the quality of your musical instruments/microphones (listen to some audio samples below). 4.) If you decided to use a PCI soundcard, then you need a little outboard mixer that will work as a preamp. Preamp is required to bring the weak instrument level signals from your microphone/instruments to line level signals suitable for recording. A good but inexpensive mixer would be Behringer Xenyx 502 . 5.) Balanced audio cables (such as XLR male to XLR male) for connecting your musical instruments to the audio mixer. Assuming you can play audio through your favorite Linux media player using your installed PCI soundcard, you are now ready to install Audacity. This procedure is written using Ubuntu distribution. Step1.) 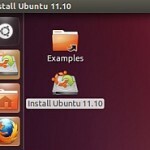 Go to Applications — Ubuntu Software Center. Step2.) In the search box, type audacity. Step3.) Click the yellow arrow. You will then see the Audacity information page. Click “Install”. You will be required to type in your Linux password. Step4.) Audacity installer will then be downloaded and installed automatically to your Linux computer. You will know that it is complete if it is not any more downloading and applying changes and it will go to the view in Step 3.) except that the “Install” word changes to “Remove”. 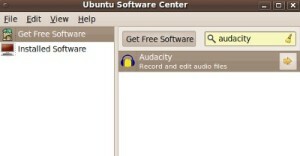 In this case, Audacity has been successfully installed in Ubuntu. Close the Ubuntu software center. Step5.) Lets launch Audacity for the first time. Go to Applications — Sound & Video — Audacity. A welcome message will pop up, just click OK and check “Don’t show this again at start up”. With this setup, you will get a benefit of balanced connection that is free of noise and interference. 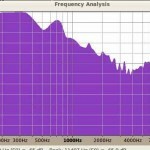 For details, you can read this tutorial on balanced vs unbalanced audio. b.) Acoustic guitars with active pickup – this assumes the guitar output is already amplified so you will need to connect the guitar TRS output to the mixer TRS line input. You do not need to use the mixer preamp input because the guitar sound is already amplified. The golden rule is to pass all instrument level signals to a preamp. Do not directly connect your microphone and musical instruments to the PCI soundcard line input. 2.) 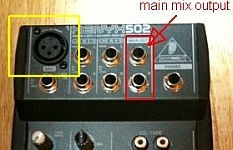 Connect the mixer main output to your sound card input. Bear in mind that you are recording only one instrument or one microphone at a time. 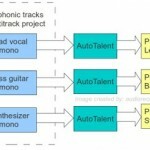 So the output that you need to record is mono. 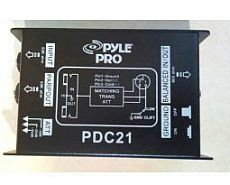 Use only one balanced mono output of the mixer and connect it to your PCI sound card balanced line input. Use TRS connector/cable because this is balanced.